"Redoutensäle" concert hall built 1696. 1803 extension by a theatre proper, installation of a common façade for both buildings. Re-opened as "Landständisches Theater". Later renamed "Landestheaer". 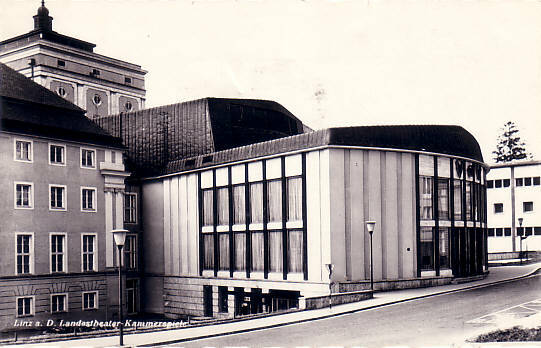 1957 auditorium rebuilding, extension by the "Kammerspiele" chamber theatre by Clemens Holzmeister. Used for opera, operetta, ballet and drama performances by the resident companies until the opening of the Musiktheater in 2013. Since then, used for drama performances by the resident company. 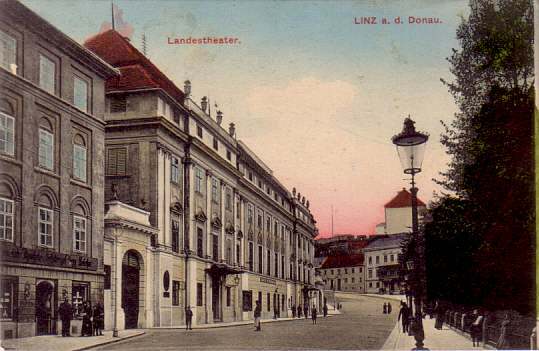 Front Text: "Linz a. d. Donau, Landestheater"
Front Text: "Linz a. D., Landestheater-Kammerspiele"